Life without any prejudices – that is a dream that has (at least in a certain way) become true for the people of Siloah. 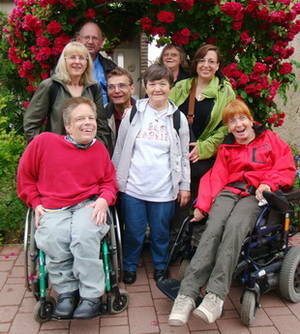 Siloah is a place for people with and without physical disabilities to come together. It offers a broad variety of leisure and educational opportunities and the possibility to get in touch with other peoplein order to exchange ideas, to learn from each other or to simply laugh and have fun together. In the world of Siloah everyone is able to realize his or her skills in a natural and self-evident matter that is not taken for granted outside of Siloah. The name originates from the lake “Siloah” close to Jerusalem on which Jesus did the impossible and cured a blind. The Siloah people tend to implement such an ideal world in which everything is possible. A world without prejudices based on tolerance, humanity, understanding and give and take – no matter of any disabilities. Get an insight of Siloah!